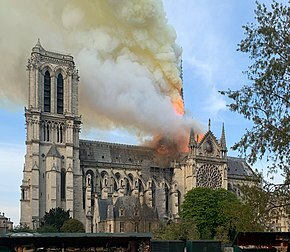 On 15 April 2019, just before 18:20 CEST, a structure fire broke out beneath the roof of Notre-Dame Cathedral, Paris. By the time it was extinguished 15 hours later, the building's spire and most of its roof had been destroyed and its upper walls severely damaged; extensive damage to the interior was prevented by its stone vaulted ceiling, which largely contained the burning roof as it collapsed. Many works of art and other religious artefacts were evacuated early in the emergency, but many others were damaged or destroyed. The cathedral's two pipe organs, and its three 13th-century rose windows, suffered little to no damage. Three people were injured. France's president Emmanuel Macron said that the cathedral would be restored, and launched a fundraising campaign which brought in pledges of over €1 billion as of 22 April 2019[update]. It has been estimated that restoration could require twenty years or more. The cathedral of Notre-Dame de Paris ("Our Lady of Paris"), part of the "Paris, Banks of the Seine" UNESCO World Heritage Site, was begun in the 12th century. Its walls and interior vaulted ceiling are of stone; its roof and flèche (spire) were of wood (much of it 13th-century oak), sheathed in lead to exclude water. The spire was rebuilt several times, most recently in the 19th century. The cathdral's stonework has been severely eroded by the action of years of weather and pollution, and the spire had extensively rotted because fissures in its lead sheathing were admitting water. In 2014, the Ministry of Culture estimated needed renovations at €150 million, and in 2016 the Archdiocese of Paris launched an appeal to raise €100 million over the following five to ten years. At the time of the fire, the spire was undergoing renovation and scaffolding had been erected around some of the roof. Extensive attention had been given to the risk of fire at the cathedral. The Paris Fire Brigade drilled regularly to prepare for emergencies there, including on-site exercises in 2018; a firefighter was posted to the cathedral each day; and fire wardens checked conditions beneath the roof three times daily. At 18:20 the fire alarm sounded and guards evacuated the cathedral within minutes; one climbed to the space beneath the roof but found no fire. At 18:43 the alarm sounded again; at 18:49 two guards investigated again, this time finding flames. The alarm system was not designed to automatically notify the fire brigade, which was summoned only at 18:51 after the guards had returned. Firefighters arrived at the church within ten minutes after the call was issued. There are reports that a technical fault in the alarm system initially directed personnel to the wrong part of the structure. White smoke rising from the roof turned black before flames appeared from the spire, then turned yellow. Police quickly evacuated the Île de la Cité. More than 400 firefighters were engaged; another hundred worked to evacuate artefacts. The fire was primarily fought from inside the structure, which was more dangerous for personnel but reduced potential damage to the cathedral; applying water from outside risked deflecting flames and hot gases (at temperatures up to 800 °C or 1500 °F) inwards. Deluge guns were used at lower-than-usual pressures to minimise damage to the cathedral and its contents. Water was supplied by boats pumping from the Seine. Aerial firefighting was not used because water dropped from heights could have done structural damage, and heated stone can crack if suddenly cooled. Helicopters were not used because of dangerous updrafts but drones were used for visual and thermal imaging, and robots for visual imaging and directing water streams. The roof's lead sheathing would initially have slowed the fire by excluding air, but once it started melting, air would be admitted allowing the fire to grow. Molten lead falling from the roof posed a special hazard for firefighters. Firefighters eventually abandoned attempts to extinguish the roof to focus on saving the two towers, which were integral to the structural survival of the entire building. Twenty firefighters attempted to climb the towers' narrow spiral stairs, but were driven back by heat. Most of the fire was extinguished by 23:30, and was considered completely extinguished after about twelve hours. The Paris fire chief said the bell towers and other parts of the building would have collapsed if the fire had continued for another 30 minutes. One firefighter and two police officers were injured. Within an hour of flames being seen, the roof and spire were fully engulfed and collapsed onto the stone vaulting that formed the ceiling of the cathedral's interior. Some sections of this vaulting collapsed in turn, allowing debris from the burning roof to fall to the marble floor below, but most sections remained intact, greatly reducing damage to the cathedral's interior. Around 23:15, officials reported that the fire had weakened and that the towers were out of danger. One third of the roof remained. Adjacent apartment buildings were evacuated due to concern about possible collapse, but on 19 April the fire brigade ruled out that risk. The cathedral contained a large number of artworks, religious artefacts, and other irreplaceable treasures, including a crown of thorns said to be the one Jesus wore at his crucifixion, a purported piece of the cross on which Jesus was crucified, the Tunic of St. Louis, a much-rebuilt pipe organ by Aristide Cavaillé-Coll, and the Virgin of Paris statue of Mary and the baby Jesus. Some artwork had been removed in preparation for the renovations, and most of the cathedral's sacred relics were held in the adjoining sacristy, which the fire did not reach; all the cathedral's relics survived. Some contents were evacuated by a human chain of emergency workers and civil servants. Many valuables that were not removed also survived, but the state of many others remains unknown. Lead joints in some of the 19th-century stained-glass windows melted, but the three major rose windows, dating to the 13th century, were undamaged; one weakened window may need to be dismantled for safekeeping. Several pews were destroyed and the sculpted arches[further explanation needed] were blackened by smoke, though the church's main cross and altar survived, along with the statues surrounding it. Some paintings, apparently only smoke-damaged, are expected to be transported to the Louvre for restoration. A number of statues, including those of the twelve Apostles at the base of the spire, had been removed in preparation for renovations. The rooster reliquary atop the spire was found damaged among the debris. The two pipe organs were not significantly damaged. Some[which?] of the cathedral's bells were preserved,[further explanation needed] including the bourdon. The liturgical treasury of the cathedral and the "grands Mays" monumental tablets were evacuated. The Agence Régionale de Santé said winds rapidly dispersed smoke aloft, and has not found elevated levels of air pollution at monitoring stations nearby. Through the night of the fire and into the next day, people gathered along the Seine to hold vigils, sing and pray. The north rose window. All three rose windows survived. 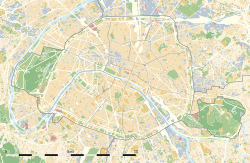 On 16 April, the Paris prosecutor said there was no evidence of a deliberate act. The fire has been compared to the similar 1992 Windsor Castle fire and the Uppark fire, among others, and has raised old questions about the safety of similar structures and the techniques used to restore them. Renovation works increase fire risk, and a police source reported they are looking into whether such work had caused this incident. The renovations presented a fire risk from sparks, short circuits, and heat from welding (roof repairs involved cutting, and welding lead sheets resting on timber ) Normally, no electrical installations were allowed in the roof space due to the extreme fire risk. The roof framing was of very dry timber, often powdery with age, and after the fire the architect responsible for fire safety at the cathedral acknowledged that the rate at which fire might spread had been underestimated, and experts said it was well known that a fire in the roof would be almost impossible to control. Of the firms working on the restoration, a Europe Echafaudage team was the only one working there on the day of the fire; the company said no soldering or welding was underway before the fire. The scaffolding was receiving electrical supply for temporary elevators and lighting. Le Bras Frères said it had followed procedure and that none of its personnel were on site when the fire broke out. On 18 April, a judicial police official unofficially reported that investigators think a short circuit was the most likely cause. Surveillance footage showed smoke first rising from the base of the spire. On the night of the fire, Macron announced that the cathedral, which is owned by the state, would be rebuilt, and launched an international fundraising campaign the next day. France's cathedrals have been owned by the state since 1905, and are not privately insured.The heritage conservation organisation Fondation du Patrimoine estimated the damage in the hundreds of millions of euros; But, according to President Robert Leblanc, losses from the fire are not expected to substantially impact the private insurance industry. European art insurers stated the cost would be similar to ongoing renovations of the Palace of Westminster in London, which currently is estimated around €7 billion. This cost does not include damage to any of the artwork or artefacts within the cathedral; art insurers said any pieces on loan from other museums would have been insured, but the works owned by the cathedral would not have been insurable. While Macron hoped the cathedral could be restored in time for the 2024 Olympic Games in Paris, architects expect the work could take from twenty to forty years, as any new structure would need to balance restoring the look of the original building, using wood and stone sourced from the same regions used in the original construction, with the structural reinforcement required for preventing a similar disaster in the future. There is discussion of whether to rebuild the cathedral in modified form. Rebuilding the roof with titanium sheets and steel trusses has been suggested; other options include rebuilding in the original lead and wood, rebuilding with modern materials not visible from the outside (like the reinforced concrete trusses at Reims Cathedral), or a combination of restored old elements and newly designed ones. French prime minister Edouard Philippe announced an architectural design competition for a new spire "adapted to the techniques and the challenges of our era." There also were many smaller pledges. A proposal by former minister Jean-Jacques Aillagon that corporate donations for Notre-Dame should get a 90% tax deduction (rather than the standard 60%) was retracted after public outcry, and some donors have said they will not seek tax deductions. ^ Including the Vatican, Prime Minister of Italy Giuseppe Conte, Secretary-General of the United Nations António Guterres,  President of the European Council Donald Tusk, President of the European Commission Jean-Claude Juncker, Elizabeth II of the United Kingdom, Prime Minister of the United Kingdom Theresa May, Minister of Foreign Affairs of Iran Javad Zarif, Chancellor of Germany Angela Merkel, Prime Minister of Spain Pedro Sánchez, Prime Minister of the Netherlands Mark Rutte, President of Portugal Marcelo Rebelo de Sousa, President of Bulgaria Rumen Radev, President of Romania Klaus Iohannis, Prime Minister of Hungary Viktor Orbán, Prime Minister of Greece Alexis Tsipras, Prime Minister of Canada Justin Trudeau, President of the United States Donald Trump, President of the People's Republic of China Xi Jinping, President of Russia Vladimir Putin, President of Israel Reuven Rivlin, King of Bahrain Hamad bin Isa Al Khalifa, Prime Minister of Australia Scott Morrison, King Mohammed VI of Morocco, President of Egypt Abdel Fattah el-Sisi, President of Latvia Raimonds Vējonis, President of Ghana Nana Akufo-Addo, President of Belarus Alexander Lukashenko, President of the Republic of China (Taiwan) Tsai Ing-wen, and Gérald Caussé, Presiding Bishop of The Church of Jesus Christ of Latter-day Saints, who is from Paris. ^ "Notre-Dame fire: Millions pledged to rebuild cathedral". BBC News. 16 April 2019. Archived from the original on 16 April 2019. Retrieved 17 April 2019. ^ a b "France vows to rebuild Notre Dame Cathedral after devastating fire". CBS News. 17 April 2019. Archived from the original on 16 April 2019. Retrieved 22 April 2019. ^ a b c "What We Know and Don't Know About the Notre-Dame Fire". The New York Times. 15 April 2019. Archived from the original on 16 April 2019. Retrieved 15 April 2019. ^ a b El-Bawab, Nadine; Newburger, Emma; Steinberg, Marty (16 April 2019). "Notre Dame will be rebuilt within the next five years, French President Emmanuel Macron says". CNBC. Archived from the original on 18 April 2019. Retrieved 23 April 2019. ^ "Paris, Banks of the Seine". UNESCO. Archived from the original on 21 March 2018. Retrieved 16 April 2019. ^ a b c d "Incendie de Notre-Dame de Paris: ce qui a été perdu et ce qui a été sauvé". Le Monde (in French). Agence France-Presse. 16 April 2019. Archived from the original on 16 April 2019. Retrieved 16 April 2019. ^ Sasuke (15 April 2019). "Notre-Dame de Paris: toute la charpente en feu, la flèche effondrée". Maliactu (in French). Archived from the original on 16 April 2019. Retrieved 16 April 2019. ^ Pyror, Ryan (15 April 2019). "The entire wooden interior of Notre Dame Cathedral has been lost". CNN. Archived from the original on 15 April 2019. Retrieved 15 April 2019. ^ Okey, Thomas (1919). The Story of Paris. J.M. Dent & Compan. p. 308. Archived from the original on 20 April 2019. Retrieved 18 April 2019. ^ Flynn, Meagan (16 April 2019). "The story behind the towering Notre Dame spire and the 30-year-old architect commissioned to rebuild it". The Washington Post. Archived from the original on 16 April 2019. Retrieved 16 April 2019. ^ a b "Notre Dame was undergoing $6.8 million renovation when massive fire broke out". CBS News. 15 April 2019. Archived from the original on 15 April 2019. Retrieved 15 April 2019. ^ "Decades of Neglect Threatened Notre Dame, Well Before It Burned". The Wall Street Journal. 18 April 2019. Archived from the original on 18 April 2019. Retrieved 18 April 2019. ^ Horgan, Rob (15 April 2019). "Notre-Dame fire: Blaze breaks out amid renovations at 12th century cathedral". New Civil Engineer. Archived from the original on 16 April 2019. Retrieved 16 April 2019. ^ "Fire breaks out at top of Notre Dame Cathedral in Paris". The Irish Independent. 15 April 2019. Archived from the original on 16 April 2019. Retrieved 16 April 2019. ^ a b "Notre-Dame Cathedral spire in Paris collapses, engulfed in flames". CBC News. Thomson Reuters. 15 April 2019. Archived from the original on 15 April 2019. Retrieved 15 April 2019. ^ Villasanta, Arthur (16 April 2019). "Notre Dame Cathedral Fire Photos: Macron Vows To Rebuild 670-Year Old Church". International Business Times. Archived from the original on 16 April 2019. Retrieved 16 April 2019. ^ a b c d e f g Breeden, Aurelien; Peltier, Elian; Alderman, Liz; Pérez-Peña, Richard (16 April 2019). "Notre-Dame Attic Was Known as 'the Forest'. And It Burned Like One". The New York Times. ^ a b c d e Hinnant, Lori (17 April 2019). "66 minutes: The frantic race to save Notre Dame". AP News. Archived from the original on 16 April 2019. Retrieved 22 April 2019. ^ a b c Katrin Bennhold, James Glanz (19 April 2019). "Notre-Dame's Safety Planners Underestimated the Risk, With Devastating Results". The New York Times. Archived from the original on 20 April 2019. Retrieved 20 April 2019. ^ Vandoorne, Saskya (16 April 2019). "Timeline of Notre Dame alarms emerges". CNN. Archived from the original on 16 April 2019. Retrieved 16 April 2019. ^ Inti Laudauro (17 April 2017). "Paris firefighters got on Notre-Dame site in less than 10 minutes". Reuters. Archived from the original on 18 April 2019. Retrieved 23 April 2019. ^ a b c d Vaux-Montagny, Nicolas; Corbet, Sylvie (19 April 2019). "Fire-ravaged Notre Dame now stabilized, firefighters leave". AP News. Archived from the original on 20 April 2019. Retrieved 20 April 2019. ^ a b c d e Nossiter, Adam; Breeden, Aurelien (15 April 2019). "Notre-Dame Cathedral in Paris Catches Fire". The New York Times. ISSN 0362-4331. Archived from the original on 15 April 2019. Retrieved 15 April 2019. ^ Hinnant, Lori; Petrequin, Samuel (15 April 2019). "Massive fire engulfs beloved Notre Dame Cathedral in Paris". AP News. Archived from the original on 15 April 2019. Retrieved 16 April 2019. ^ a b "Notre-Dame: Massive fire ravages Paris cathedral". BBC News. 16 April 2019. Archived from the original on 16 April 2019. Retrieved 22 April 2019. ^ "La catedral de Notre Dame de París sufre un importante incendio". El País (in Spanish). 15 April 2019. ISSN 1134-6582. Archived from the original on 15 April 2019. Retrieved 15 April 2019. ^ a b c Berlinger, Joshua (16 April 2019). "Why the Notre Dame fire was so hard to put out". CNN. Archived from the original on 17 April 2019. Retrieved 24 April 2019. ^ a b c d "Six questions sur l'incendie de Notre-Dame de Paris" [Six questions about the fire of Notre-Dame]. Le Parisien (in French). 16 April 2019. Archived from the original on 16 April 2019. Retrieved 16 April 2019. ^ "400 firefighters mobilized for Notre Dame blaze". CNN. 15 April 2019. Retrieved 15 April 2019. ^ "Fire at Notre Dame Cathedral under control; firefighters have saved cathedral's towers". NewsChannel5 Nashville. 15 April 2019. Retrieved 15 April 2019. ^ a b Schechner, Sam; Kostov, Nick (17 April 2019). "How Paris Firefighters Helped Preserve Notre Dame Towers". The Wall Street Journal. Archived from the original on 18 April 2019. Retrieved 18 April 2019. ^ "Cathedral fire under control after spire and roof destroyed – as it happened". The Guardian. Retrieved 16 April 2019. ^ Capps, Kriston; O'Sullivan, Feargus (15 April 2019). "How Catastrophic Is the Notre-Dame Cathedral Fire?". CityLab. Archived from the original on 16 April 2019. Retrieved 16 April 2019. ^ Navarro, Alyssa (17 April 2019). "French Firefighting Robot Colossus Helped Save Burning Notre Dame Cathedral". Tech Times. Archived from the original on 17 April 2019. Retrieved 17 April 2019. ^ Irfan, Umair (16 April 2019). "Why the Notre Dame fire was so destructive, according to fire experts". Vox. Archived from the original on 17 April 2019. Retrieved 18 April 2019. ^ Kobie, Nicole (16 April 2019). "The hot, dangerous physics of fighting the Notre Dame fire". Wired UK. Archived from the original on 18 April 2019. Retrieved 18 April 2019. ^ Ganley, Elaine; Corbet, Sylvie (18 April 2019). "Police official: Short-circuit likely caused Notre Dame fire". The Washington Post. Associated Press. Archived from the original on 19 April 2019. Retrieved 19 April 2019. ^ Hjelmgaard, Kim; Rosman, Rebecca; Garrison, Joey (16 April 2019). "'The fire is out': Paris firefighters succeed after 12-hour battle to extinguish Notre Dame Cathedral blaze". USA Today. Archived from the original on 16 April 2019. Retrieved 16 April 2019. ^ a b Beswick, Emma; Abellan Matamoros, Cristina (18 April 2019). "Notre Dame fire: Global contest launched to design new spire for blaze-hit cathedral". Euronews. Archived from the original on 15 April 2019. Retrieved 24 April 2019. ^ a b Buchanan, Larry; Cai, Weiyi; Glanz, James; Gröndahl, Mika; Grothjan, Evan; McCann, Allison; Parshina-Kottas, Yuliya; Patanjali, Karthik; Patel, Jugal K.; Reinhard, Scott; Saget, Bedel; Singhvi, Anjali; White, Jeremy (16 April 2019). "How the Notre Dame Cathedral Fire Spread". New York Times. Retrieved 24 April 2019. ^ a b Lapin, Tamar (15 April 2019). "Photos show center of Notre Dame cathedral miraculously intact". New York Post. Archived from the original on 16 April 2019. Retrieved 16 April 2019. ^ Prior, Ryan (15 April 2019). "The entire wooden interior of Notre Dame Cathedral has been destroyed". CNN. Archived from the original on 15 April 2019. Retrieved 16 April 2019. ^ Goodheart, Adam (17 April 2019). "Who saved Notre Dame? Its builders". Op-Ed. Los Angeles Times. Archived from the original on 23 April 2019. Retrieved 23 April 2019. ^ "NOW: French official says 'both towers of the cathedral are safe' and the fire is cooling". CNN. 15 April 2019. Retrieved 15 April 2019. ^ a b Martichoux, Alix (15 April 2019). "What's inside the Notre Dame Cathedral in Paris". San Francisco Chronicle. Archived from the original on 15 April 2019. Retrieved 15 April 2019. ^ Hartley-Parkinson, Richard (16 April 2019). "Notre Dame crown of thorns and St Louis tunic saved from cathedral fire". Metro. Archived from the original on 16 April 2019. Retrieved 16 April 2019. ^ a b Buncombe, Andrew (15 April 2019). "Notre Dame's historic statues safe after being removed just days before massive fire". The Independent. Archived from the original on 15 April 2019. Retrieved 15 April 2019. ^ a b McAuley, James; Whitt, Griff (15 April 2019). "Notre Dame Cathedral spire collapses as Paris monument is consumed by fire". The Washington Post. Archived from the original on 15 April 2019. Retrieved 15 April 2019. ^ Adamson, Thomas (19 April 2019). "Drunk on smoke: Notre Dame's bees survive cathedral blaze". Star Tribune. Associated Press. Archived from the original on 19 April 2019. Retrieved 19 April 2019. ^ a b c Lough, Richard; Pineau, Elizabeth (16 April 2019). "No sign of arson in Notre-Dame blaze as nation grieves for symbol". Reuters. Archived from the original on 16 April 2019. Retrieved 16 April 2019. ^ a b Marshall, Alex; Stack, Liam; Murphy, Heather (15 April 2019). "Notre-Dame: Fate of Priceless Cultural Treasures Uncertain". The New York Times. ISSN 0362-4331. Archived from the original on 16 April 2019. Retrieved 16 April 2019. ^ Guyonnet, Paul (16 April 2019). "Notre-Dame: Les vitraux des rosaces ont survécu à l'incendie". Huffington Post France (in French). Archived from the original on 16 April 2019. Retrieved 16 April 2019. ^ Hignett, Katherine (16 April 2019). "Notre Dame 'miracle'? Rose windows' stained glass appears to have survived savage blaze". Newsweek. Archived from the original on 16 April 2019. Retrieved 17 April 2019. ^ White, Sarah; Pineau, Elizabeth (16 April 2019). "Notre-Dame's famed rose window spared but blaze harms priceless artworks". Reuters. Archived from the original on 16 April 2019. Retrieved 17 April 2019. ^ "'The church is burning and the whole world is crying' – Parisians mourn for Notre-Dame". The Local. 16 April 2019. Archived from the original on 17 April 2019. Retrieved 20 April 2019. ^ "Notre-Dame counts cost as daylight reveals damage". Yahoo! News. Agence France-Presse. 16 April 2019. Archived from the original on 16 April 2019. Retrieved 16 April 2019. ^ "Fire damage inside Notre Dame Cathedral". NBC4i.com. WCMH. 16 April 2019. Archived from the original on 16 April 2019. Retrieved 16 April 2019. ^ Pierre, Thomas (16 April 2019). "Le coq de la flèche a été retrouvé". RTL (in French). Agence France-Presse. Retrieved 16 April 2019. ^ "L'orgue principal de Notre-Dame de Paris miraculeusement préservé" (in French). Europe 1. 16 April 2019. Archived from the original on 16 April 2019. Retrieved 16 April 2019. ^ Marshall, Alex (24 April 2019). "Notre-Dame Musicians Rejoice That Cathedral's Organ Was Spared". The New York Times. ISSN 0362-4331. Retrieved 24 April 2019. ^ "Incendie de Notre-Dame de Paris: point sur la situation". paris.fr (in French). Archived from the original on 20 April 2019. Retrieved 20 April 2019. ^ "France's Macron requests post-fire pause from politics". AP News. 16 April 2019. Archived from the original on 23 April 2019. Retrieved 23 April 2019. ^ a b Momtaz, Rym; Gehrke, Laurenz (16 April 2019). "Notre Dame fire 'fully extinguished' as fundraising starts". Politico. Archived from the original on 20 April 2019. Retrieved 23 April 2019. ^ a b "The Latest: French leader vows to rebuild damaged Notre Dame". AP News. 15 April 2019. Archived from the original on 15 April 2019. Retrieved 15 April 2019. ^ "Incendio Notre Dame, lo sgomento del mondo: «Brucia una parte di noi»". Corriere della Sera. 15 April 2019. Retrieved 23 April 2019. ^ "UN chief: 'Horrified by the pictures coming from Paris'". CNN. 15 April 2019. Retrieved 15 April 2019. ^ Tusk, Donald [@eucopresident] (15 April 2019). "Notre-Dame de Paris est Notre-Dame de toute l'Europe. We are all with Paris today" (Tweet) (in French) – via Twitter. ^ "'We are all with Paris today': International sorrow as fire ravages Notre-Dame". EURACTIV. 16 April 2019. Archived from the original on 17 April 2019. Retrieved 19 April 2019. ^ "World leaders react to tragic blaze at iconic Notre Dame cathedral". Axios. Archived from the original on 15 April 2019. Retrieved 16 April 2019. ^ "Queen Elizabeth says deeply saddened by Notre Dame blaze". Reuters. 16 April 2019. Archived from the original on 16 April 2019. Retrieved 16 April 2019. ^ UK Prime Minister [@10DowningStreet] (15 April 2019). "'My thoughts are with the people of France tonight and with the emergency services who are fighting the terrible blaze at Notre-Dame cathedral.' – PM @Theresa_May" (Tweet) – via Twitter. ^ "Notre Dame fire: Live updates". CNN. 15 April 2019. Archived from the original on 15 April 2019. Retrieved 15 April 2019. ^ "Notre-Dame: «attristé», l'Iran pense aux «Français et à tous les catholiques»". Le Figaro. 16 April 2009. Archived from the original on 23 April 2019. Retrieved 23 April 2019. ^ "Germany's Merkel saddened to see Notre-Dame on fire". Reuters. 15 April 2019. Retrieved 16 April 2019. ^ Selsky, Andrew (15 April 2019). "Around world, 'our hearts ache' at Notre Dame Cathedral fire". AP News. Archived from the original on 15 April 2019. Retrieved 22 April 2019. ^ "Presidente da República enviou mensagem ao seu homólogo francês". presidencia.pt (in Portuguese). 15 April 2019. Retrieved 16 April 2019. ^ "Notre Dame cathedral fire: President and prime minister express sympathy with France". Radio Bulgaria. 16 April 2019. Archived from the original on 23 April 2019. Retrieved 23 April 2019. ^ Insider, Ro (16 April 2019). "Romania's president reacts to Notre Dame fire". romania-insider.com. Archived from the original on 19 April 2019. Retrieved 22 April 2019. ^ "Orbán expresses sympathies over Notre Dame fire". Hungary Matters. Archived from the original on 17 April 2019. Retrieved 17 April 2019. ^ "Η δήλωση Τσίπρα για την Παναγία των Παρισίων". Η Εφημερίδα των Συντακτών (in Greek). Archived from the original on 16 April 2019. Retrieved 16 April 2019. ^ Hinnant, Lori. "Roof and spire collapse as fire engulfs Notre-Dame Cathedral in Paris". Citytv. Archived from the original on 16 April 2019. Retrieved 16 April 2019. ^ "President Trump on the 'terrible, terrible fire'". CNN. 15 April 2019. Retrieved 15 April 2019. ^ "Statement by the Press Secretary on the Cathedral of Notre Dame de Paris". The White House. 16 April 2019. Archived from the original on 19 April 2019. Retrieved 19 April 2019. ^ "Xi sends condolence to Macron over Notre Dame fire". Xinhua News Agency. 16 April 2019. Archived from the original on 16 April 2019. Retrieved 16 April 2019. ^ "Message to Emmanuel Macron". Russian Presidential Executive Office. 16 April 2019. Archived from the original on 16 April 2019. Retrieved 16 April 2019. ^ "President Rivlin offers solidarity with France as Notre Dame burns". The Times of Israel. Retrieved 15 April 2019. ^ "HM King offers solidarity with France". Gulf Daily News. 16 April 2019. Retrieved 16 April 2019. ^ "Morocco king vows solidarity with France following Notre Dame Cathedral fire". Xinhua News Agency. 16 April 2019. Retrieved 16 April 2019. ^ "Sisi expresses solidarity with France over Paris cathedral fire". Egypt Today. MENA. 15 April 2019. Retrieved 16 April 2019. ^ "Bells ring out in Rīga in support of France and Notre Dame". Public Broadcasting of Latvia. 16 April 2019. Archived from the original on 18 April 2019. Retrieved 16 April 2019. ^ "Notre Dame Cathedral fire: Akufo-Addo comiserates with France". Graphic Online. 16 April 2019. Archived from the original on 16 April 2019. Retrieved 17 April 2019. ^ "Condolences to France President Emmanuel Macron". President of the Republic of Belarus. 16 April 2019. Archived from the original on 19 April 2019. Retrieved 19 April 2019. ^ Eyre, Aubrey (15 April 2019). "Hope from ashes: Why the Notre Dame fire is a symbol of rebirth during Holy Week". Church News. Archived from the original on 16 April 2019. Retrieved 16 April 2019. ^ Kirby, Jen (16 April 2019). "Notre Dame, one of Paris's most iconic landmarks, damaged in a massive fire". Vox. Archived from the original on 15 April 2019. Retrieved 23 April 2019. ^ Stableford, Dylan (15 April 2019). "Fire erupts at Notre Dame Cathedral in Paris". Yahoo News. Archived from the original on 15 April 2019. Retrieved 15 April 2019. ^ Blamont, Matthias; de Clercq, Geert (16 April 2019). "In the heart of Paris, a wounded Notre-Dame stirs emotions". Reuters. Archived from the original on 16 April 2019. Retrieved 16 April 2019. ^ "Parisians sing hymns as they watch Notre Dame burning – video". The Guardian. Reuters/AP. 16 April 2019. Archived from the original on 16 April 2019. Retrieved 17 April 2019. ^ Garrand, Danielle (16 April 2019). "Stunning video shows people singing hymn to honor Notre Dame as it burned". CBS News. Archived from the original on 16 April 2019. Retrieved 22 April 2019. ^ a b Damgé, Mathilde; Dagorn, Gary; Durand, Anne-Aël (16 April 2019). "Nantes, Lunéville, Windsor... les derniers grands incendies de bâtiments historiques". Le Monde (in French). Archived from the original on 17 April 2019. Retrieved 17 April 2019. ^ Captain, Sean (15 April 2019). "Notre-Dame fire: Why historic restorations keep going up in flames". Fast Company. Archived from the original on 16 April 2019. Retrieved 16 April 2019. ^ a b Rose, Michael; Carriat, Julie (18 April 2019). "Time-lapse shots of Notre-Dame spire may offer clues on blaze". Reuters. Archived from the original on 19 April 2019. Retrieved 18 April 2019. ^ "Notre-Dame: les échafaudeurs livrent leur version des faits". L'Obs (in French). 18 April 2019. Archived from the original on 18 April 2019. Retrieved 23 April 2019. ^ Rowland, Oliver (17 April 2019). "Alarms on spire scaffolding did not go off". The Connexion. Archived from the original on 19 April 2019. Retrieved 23 April 2019. ^ Le Bras Frères Archived 31 January 2019 at the Wayback Machine, a company specialized in roofing including for heritage roofing restoration. ^ Morris, James (18 April 2019). "Notre Dame fire: Cathedral blaze was most likely caused by electrical short circuit, police official says". London Evening Standard. Archived from the original on 18 April 2019. Retrieved 18 April 2019. ^ Diebelius, Georgia (18 April 2019). "Notre Dame cathedral fire was 'caused by electrical short circuit'". Metro. Archived from the original on 18 April 2019. Retrieved 18 April 2019. ^ Miller, Susan (18 April 2019). "Report: Likely cause of Notre Dame Cathedral fire an electrical short-circuit". USA Today. Retrieved 18 April 2019. ^ Chakraborty, Barnini (18 April 2019). "Notre Dame fire likely caused by electrical short-circuit, investigators believe". Fox News. Archived from the original on 18 April 2019. Retrieved 18 April 2019. ^ "Chartres Cathedral – Cathédrale Notre-Dame de Chartres". Archived from the original on 17 April 2019. Retrieved 18 April 2019. ^ Chrisafis, Angelique; Henley, Jon (16 April 2019). "Notre Dame fire: Macron pledges to rebuild devastated Paris cathedral". The Guardian. ISSN 0261-3077. Archived from the original on 16 April 2019. Retrieved 16 April 2019. ^ Lam, Kristin (15 April 2019). "The Notre Dame Cathedral will rise again, French President Emmanuel Macron promises". USA Today. Retrieved 16 April 2019. ^ a b c Mallet, Victor; Agnew, Harriet (16 April 2019). "Macron says he wants Notre-Dame rebuilt in 5 years". Financial Times. Retrieved 24 April 2019. ^ a b c Ott, Haley (16 April 2019). "Why an expert says it could take 40 years to rebuild Notre Dame". CBS News. Archived from the original on 16 April 2019. Retrieved 17 April 2019. ^ "Our organization". Fondation Avenir du Patrimoine à Paris. Retrieved 24 April 2019. ^ Chiglinsky, Katherine (17 April 2019). "France's Axa Insured Notre Dame Art, Two Construction Firms". Bloomberg. Retrieved 24 April 2019. ^ a b Hussain, Noor Zainab; Arnold, Paul (16 April 2019). "Insurers expect France to bear Notre-Dame rebuilding cost". Reuters. Archived from the original on 16 April 2019. Retrieved 16 April 2019. ^ Miller, Ryan W.; Rice, Doyle; Lam, Kristin (17 April 2019). "Why Notre Dame didn't completely crumble in the blaze. And why it could take decades to repair". USA Today. Archived from the original on 20 April 2019. Retrieved 23 April 2019. ^ Kar-Gupta, Sudip; Lough, Richard (18 April 2019). "Steelmaker ArcelorMittal to offer steel for Notre-Dame Cathedral restoration". Reuters. Archived from the original on 18 April 2019. Retrieved 18 April 2019. ^ Jackson, Patrick (18 April 2019). "How new tech might help Notre-Dame rebuild". BBC News. Archived from the original on 18 April 2019. Retrieved 18 April 2019. ^ Silverstein, Hannah; Camerlenghi, Nicola (18 April 2019). "After the Fire, a 21st-Century Notre Dame". Dartmouth News. Archived from the original on 20 April 2019. Retrieved 22 April 2019. ^ Clarke, Joseph L. "Opinion: The reconstruction of Notre-Dame is not the only answer". The Globe and Mail. Archived from the original on 18 April 2019. Retrieved 18 April 2019. ^ Cole, Brendan (17 April 2019). "Notre Dame Fire: France Is Holding an International Competition for Architects to Design the Cathedral's New Spire". Newsweek. Retrieved 24 April 2019. ^ Casert, Raf (22 April 2019). "Notre Dame fire was a warning bell. But will Europe listen?". AP News. Archived from the original on 23 April 2019. Retrieved 23 April 2019. ^ Nugent, Ciara (17 April 2019). "Pledges Reach Almost $1 Billion To Rebuild Paris' Notre Dame Cathedral". Time. Archived from the original on 23 April 2019. Retrieved 23 April 2019. ^ "Billionaire Arnault's family and LVMH to donate 200 mln euros for Paris' Notre-Dame". Reuters. 16 April 2019. Archived from the original on 16 April 2019. Retrieved 16 April 2019. ^ "Notre-Dame: LVMH et la famille Arnault annoncent un 'don de 200 millions d'euros'". Le Figaro (in French). 16 April 2019. Archived from the original on 16 April 2019. Retrieved 16 April 2019. ^ "Incendie à Notre-Dame: la famille Pinault débloque 100 millions d'euros". Le Figaro (in French). 16 April 2019. Archived from the original on 17 April 2019. Retrieved 17 April 2019. ^ "France-Total fait un don de 100 millions d'euros pour Notre-Dame de Paris". Le Figaro (in French). 16 April 2019. Archived from the original on 16 April 2019. Retrieved 16 April 2019. ^ "Notre-Dame: la mairie de Paris débloque 50 millions d'euros". courrier-picard.fr (in French). 16 April 2019. Archived from the original on 16 April 2019. Retrieved 23 April 2019. ^ a b c "Notre-Dame de Paris: cagnottes, promesses de dons et souscription nationale pour financer la reconstruction". Le Monde (in French). 16 April 2019. Archived from the original on 16 April 2019. Retrieved 16 April 2019. ^ Roca, Cristina (17 April 2019). "BNP Paribas, SocGen Join Notre Dame Donor List as Pledges Exceed $790 Million". Market Screener. Dow Jones. Archived from the original on 17 April 2019. Retrieved 23 April 2019. ^ "Le secteur privé promet près de 700 millions d'euros pour reconstruire Notre-Dame". Boursorama (in French). AFP. 16 April 2019. Archived from the original on 16 April 2019. Retrieved 16 April 2019. ^ "AXA s'associe à l'élan de solidarité après l'incendie de Notre-Dame de Paris" (Press release) (in French). AXA. 16 April 2019. ^ "Plus de 800 millions d'euros de dons pour la reconstruction de Notre-Dame". Les Dernières Nouvelles d'Alsace (in French). 16 April 2019. Archived from the original on 16 April 2019. Retrieved 23 April 2019. ^ "Entreprises et grandes fortunes se mobilisent pour la reconstruction de Notre-Dame". La Croix (in French). 16 April 2019. ISSN 0242-6056. Archived from the original on 16 April 2019. Retrieved 16 April 2019. ^ a b "Le secteur privé promet autour de 700 millions d'euros pour reconstruire Notre-Dame". Boursorama (in French). Agence France-Presse. 16 April 2019. ^ a b Petrequin, Samuel (19 April 2019). "Anger followed Notre Dame grief for yellow vest protesters". AP News. Archived from the original on 20 April 2019. Retrieved 22 April 2019. ^ "Vlada Srbije uputila Francuskoj milion evra za obnovu katedrale Notr Dam". N1 Srbija (in Serbian). Archived from the original on 22 April 2019. Retrieved 22 April 2019. ^ Alderman, Liz; Erlanger, Steven (17 April 2019). "As Rich Lavish Cash on Notre-Dame, Many Ask: What About the Needy?". The New York Times. Archived from the original on 20 April 2019. Retrieved 20 April 2019. Wikimedia Commons has media related to 2019 Notre-Dame de Paris fire. This page was last edited on 25 April 2019, at 10:54 (UTC).